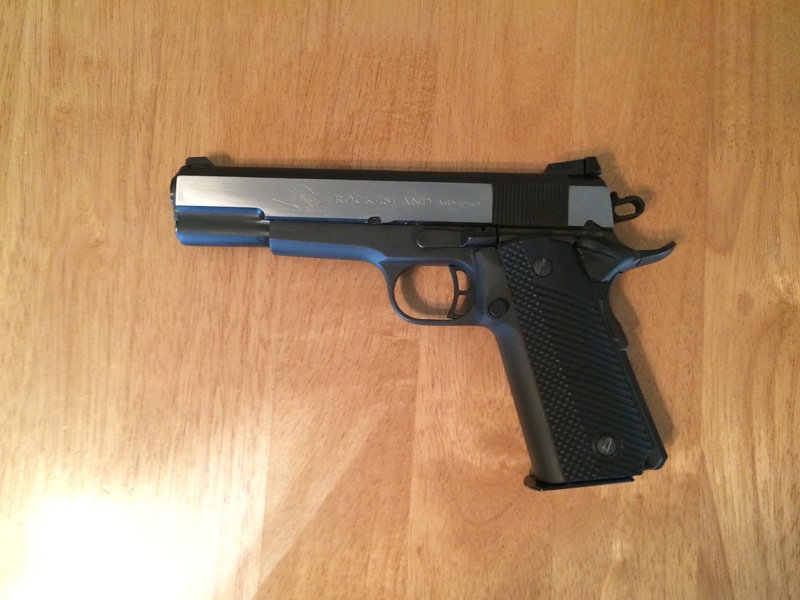 Back in December, I traded my Kimber Stainless Pro Carry II for a Rock Island Armory .22TCM/9mm 1911A2. I had initially been looking for an Officers or Commander-sized 9mm 1911, but this one just looked to good to pass up. Here’s my initial impressions of the weapon. After a month of living with the thing, and making a few important changes (for me), here’s my review of the pistol. 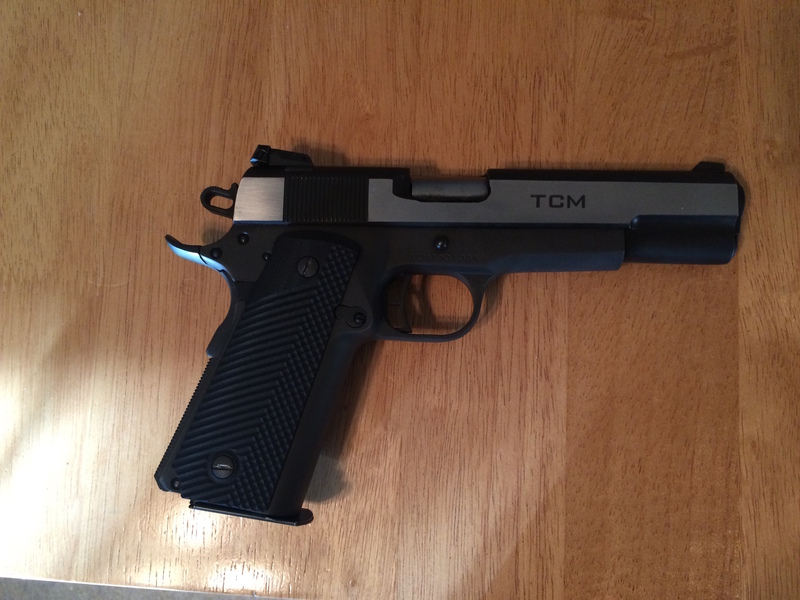 It turns out, this is one of the first runs of the TCM, according to the guys in Nevada, with a low serial number. The pistol had been worked on a bit before I got it. The previous owner polished the slide flats, giving it a Kimber Eclipse kind of look. (Good thing I live in the desert, or I’d have to be at this consistently to combat rust.) Fit and finish, otherwise, is better than the usual RIA Gi models, not as good as the higher end models from Ruger, Springfield, or Kimber. It came with Hogue wrap around grips with the finger grooves the first owner had dropped on it. Those came off as soon as I could get to it; I hate finger groove grips (your mileage may vary, and whatever god bless you for it, but I hate them) and the only real choice was the VZ G10 grips for it. Apparently, grips for the Para P-14 will also work, but might need work to get the grip screw holes to line up properly. I didn’t feel like dealing with that, so it was either modify the Hogue (still an option, I suppose…) or these. If you do the VZ Grips, you may need to get a Dremel out and do some work. The tabs to cover the inner workings stick out a bit. I’m left handed, so they don’t bite me, but a few rounds shooting right handed showed the tabs are sharp and still out a bit under the safety switch. I’m going to sand them down to fit more comfortably, eventually. These grips flattened the cross-section of the grip so even my wife finds it not uncomfortable; without the finger grooves, I can index my digits more naturally. The result was a much clearer picture of the pistol’s capabilities. Not taking my time, a two inch group, spot on the target, is possible at 10 yards in 9mm; point shooting, old-school style, gives me similar accuracy, one or two handed. The groups are about half an inch tighter with .22TCM, but fall about two inches low inside 10 yards. Out to 25 yards, taking my time and unsupported, the rounds in 9mm drop about two inches from point of aim in a 2-3″ group. In .22TCM, it’s similar groupings, but with the right elevation at that range. Part of the reason this was possible is an exceedingly good trigger, that broke at just a hair under 4 lbs., according to the scale of one of the competition guys at the indoor range I was at that first day. It really is a remarkably high-quality trigger and hammer combo. The magazine accommodates 17 rounds of 9mm or 18 rounds of .22 TCM (Tuason Craig Magnum) and this pistol came with a flush fit, flat bottomed magazine. It’s good quality machining, properly finished so that the magazines slip in and out smoothly and function well. I’ve ordered another. The wide body A2 is similar to the Para-Ordinance 1911A2, but the TCM is just a bit off from even Rock Island’s A2s for the grip screw placement. Also, it doesn’t seem to like a few of the standard 1911 holsters (a big surprise to me.) It will not lock into my Blackhawk SERPA for the 1911 Government model. I’ve yet to try others as this thing is heavy at about 41 oz. in 9mm (probably about 39 with a mag of the TCM.) It’s a bag/car gun, right now. As for the longevity of the round, Rock Island has a new .22 TCM 9R round that will fit in a conversion barrel for the Glock 17. As with the TCM, you use the same magazines the pistol normally uses. They also have a bolt gun that uses the 17 round pistol mags coming, a single stack version of the 1911, and a few other small manufacturers are toying with semi-auto carbines for the .22 TCM. I’d say the chance of it sticking around is on par with the 5.7x28mm, which it is a definite match for, if maybe slightly superior to, FN’s civilian SS197 ammunition. I’ve so far been able to find the ammo reliably in several shops in Albuquerque, and it’s been in stock online for about $17 a box whenever I’ve checked, thus far. And if you can’t find it? It’s a 9mm. Is the Rock Island worth the $600-750 price tag? Yes, unequivocally. UPDATE: I did buy a new magazine for the Rock Island TCM a few weeks ago, and after ordering the wrong one — which Armscor didn’t just replace with the correct one, they refunded my money because of the error — I finally encountered an issue that turns up on some reviews and boards regarding the gun: it locks the slide on the last round. you can hit the slide stop and fire the last round with no issue, but it will lock open as if empty with one round left. The issue was easy to diagnose putting the mags side by side. The follower on the new mag is flat and engages too early; the older one is shaved at the corner just a millimeter or so (I’ve yet to measure it), but that allows the weapon to function properly. It should be a few minute fix with a file, if it really bothers you.